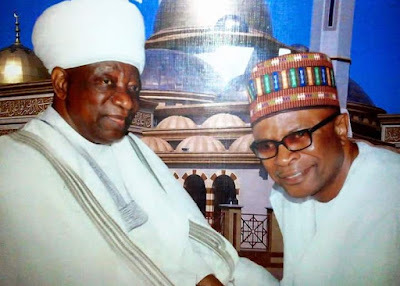 Home / News / Politics / Emir Of Ilorin Endorses Lukman Mustapha? Emir Of Ilorin Endorses Lukman Mustapha? in Kwara state to yield to the yearnings of Kwarans in 2019. The Emir who reportedly made this call at his palace in Ilorin, said Kwarans deserve the best in Lukman Mustapha and urged him to give Kwarans his best. Alh. Lukman Mustapha was at the Emir's palace on courtesy visit. Impeccable source at the palace informed us that the Emir said Lukman Mustapha is the first son of Ilorin to deploy his personal wealth and resources to establish employment generating mega venture in Ilorin, the seat of the Emirate. According to information available to this medium, the Emir said he is not surprised at the regular and uncommon magnanimity of Alh. Lukman Mustapha because of the antecedent and pedigree of his father, Alhaji Shehu Usman Mustapha, who is the Wali of Ilorin. Recall that the Emir, at the commissioning of SOBI 101.9 FM, had earlier enjoined all Kwarans, especially sons and daughters of Ilorin to feel free to join and aspire for political positions on any political platform of their choice. The Emir stated that as keen watchers and observers of Kwara politics, he is abreast of the quests of Kwarans for purposeful leadership and as father to all, the onus is on him to equally align himself with the aspiration of his people. He said though as a father to all, he is not expected to openly canvass for support for anyone, but there is nothing wrong in commending and giving kudos to philanthrophist like Lukman Mustapha who deserves great commendations for the great things he has done to Kwara and for Kwarans. He however enjoins Alh. Lukman Mustapha to go about the pursuance of his aspiration peacefully without rancour and without minding the antics of the detractors. Alh. Lukman Mustapha who said the purpose of his visit to the Emir was the usual courtesy call of a son to a dependable father, expressed his deep appreciation for the fatherly support of the Emir and pledge not to let the Emir and the entire Kwarans down. Recall that in the past few months, Kwarans from all walks of lives have repeatedly called on the scion of Sobi FM to join the race for Kwara Government House ahead of 2019 due to his giant philantrophic strides and unalloyed interests in the common good of the state. In what appears to be acceeding to the clarion calls, Alh. Lukman Mustapha has commenced state wide consultations amongst members of his family, friends, associates and members of the political class, especially, the Kwara PDP family. So far, Kwarans in every nooks and crannies have received news of his aspiration for Kwara Governor with great enthusiasm and excitement. As the race towards towards 2019 Governorship election commences in Kwara, Alh. Lukman Mustapha remains a key player to look forward to and watchout for.